Primitive emotion. That is what one feels when watching the eye-popping spectacle Plic Ploc, the latest creation by Cirque Plume. An emotion that doesn’t just take us back to our childhood (leave that to Disney), but back to our last remaining atoms of the noble savage within, freshly emerged from his cave, who explains the unknown by calling it magic. Like Tim Burton with Ed Wood, or Quentin Tarantino with Kill Bill, who express such an absolute faith in the power of their art so that we proclaim, “this is true cinema”, Plic Ploc and its marvelous conductor, Bernard Kudlak make us jump out of our seats with an exclamation point over our smiles and proclaim, “this is true circus”. We feel like we are experiencing it for the first time…from that moment the emotion could not be anything but naked, instinctive, primitive, and once again, completely devoid of any intellectual parasitism. It is magic because it is beautiful, it is beautiful because it is magic, period. In the end, how does one explain the enchanting… should it even be attempted? In the beginning: a drop of water. A delicate pearl of liquid that does not hesitate to flood the circus imagination and leave us overflowing with enthusiasm. 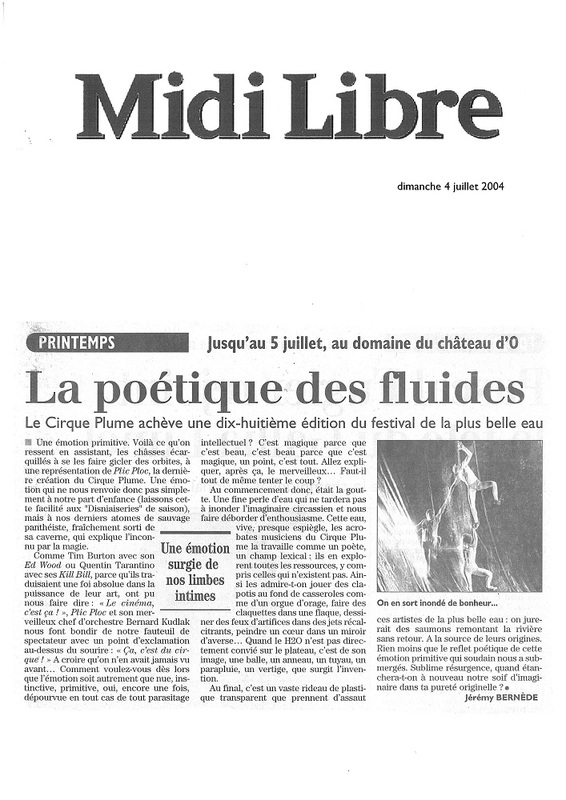 The acrobat/musicians of Cirque Plume work with the water, alive and almost mischievous, the way a poet works with words: exploring all of its facets, even those that don’t exist. Thus we admire them as they play pots and pans like a thunderstorm organ, tap dance in puddles of water, turn recalcitrant water jets into fireworks, paint a heart in a mirror of rain showers… When the H2O is not directly invited to the stage, it is from its image, a ball, a ring, a hose, an umbrella, a moment of dizziness, that invention arises. For the finale, the artists assault a vast transparent plastic curtain like salmon running upriver with no hope of return, back to the source of their origins. The poetic reflection of this primitive emotion suddenly submerges us. When will we next quench our thirsty imagination in the sublime resurgence of its original purity?